Mishnaic scholar of the second generation (first century C.E. ); junior contemporary of Gamaliel II., Eliezer b. Hyrcanus, and Joshua b. Hananiah, and senior of Akiba (Sifre, Deut. 32; Sanh. 101a). He traced his pedigree for ten generations back to Ezra (Ber. 27b; Yer. Yeb. i. 3b), and was very wealthy (Shab. 54b; Beẓah 23a; compare Ḳid. 49b). These circumstances, added to his erudition, gained for him great popularity. When Gamaliel II., in consequence of his provoking demeanor, was temporarily deposed from the patriarchate, Eleazar, though still very young, was elevated to that office by the deliberate choice of his colleagues. He did not, however, occupy it for any length of time, for the Sanhedrin reinstated Gamaliel. He was retained as vice-president ("ah bet din"), nevertheless, and it was arranged that Gamaliel should lecture three (some say two) Sabbaths, and Eleazar every fourth (or third) Sabbath (Ber. 27b et seq. ; Yer. Ber. iv. 7c et seq. ; Yer. Ta'an. iv. 67d). In company with Gamaliel, Joshua, and Akiba, he journeyed to Rome (Kallah R. vii. ; Derek Ereẓ R. v.). Neither the object of the journey nor the result of the mission is stated; but that affairs important as pressing were involved is apparent from the season at which the journey was undertaken: they celebrated the Feast of Booths aboard the ship (Sifra, Emor, xvi. 2; Suk. 41b). With the same companions Eleazar once visited the ruins of the Temple at Jerusalem (Sifre, Deut. 43). On a visit to the aged Dosa b. Harkinas the latter joyfully exclaimed, "In him I see the fulfilment of the Scriptural saying (Ps. xxxvii. 25): 'I have been young, and now am old; yet have I not seen the righteous forsaken, nor his seed begging bread'" (Yeb. 16a; Yer. Yeb. i. 3c et seq. ), by which he probably alluded to Eleazar's great learning and his proverbial wealth. The latter was amassed by dealing in wine, oil (Tosef., 'Ab. Zarah, v. 1; B. B. 91a), and cattle (Shab. 54b; Beẓah 23a). Subsequent generations entertained the belief that dreaming of Eleazar b. Azariah presaged the acquisition of wealth. With Eleazar's accession to the patriarchate the portals of the academy were opened wide to all who sought admittance. It is said that three hundred benches had to be added for the accommodation of the eager throngs which pressed into the halls of learning. Under his presidency, too, a review of undecided points of law was undertaken. 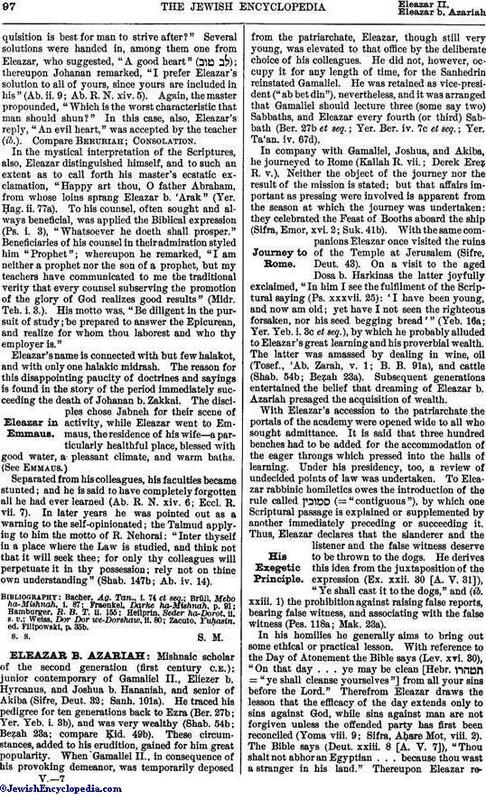 To Eleazar rabbinic homiletics owes the introduction of the rule called (= "contiguous"), by which one Scriptural passage is explained or supplemented by another immediately preceding or succeeding it. Thus, Eleazar declares that the slanderer and the listener and the false witness deserve to be thrown to the dogs. He derives this idea from the juxtaposition of the expression (Ex. xxii. 30 [A. V. 31]), "Ye shall cast it to the dogs," and (ib. xxiii. 1) the prohibition against raising false reports, bearing false witness, and associating with the false witness (Pes. 118a; Mak. 23a). In his homilies he generally aims to bring out some ethical or practical lesson. With reference to the Day of Atonement the Bible says (Lev. xvi. 30), "On that day . . . ye may be clean [Hebr. = "ye shall cleanse yourselves"] from all your sins before the Lord." Therefrom Eleazar draws the lesson that the efficacy of the day extends only to sins against God, while sins against man are not forgiven unless the offended party has first been reconciled (Yoma viii. 9; Sifra, Aḥare Mot, viii. 2). The Bible says (Deut. xxiii. 8 [A. V. 7]), "Thou shalt not abhor an Egyptian . . . because thou wast a stranger in his land." Thereupon Eleazar remarks,"The Egyptians admitted the Israelites out of self-interest; nevertheless God accounts their act as one of merit. Now, if he who unintentionally confers a favor is accorded a token of merit, how much more so he who intentionally does a good deed" (Sifre, Deut. 252; compare Ber. 63b). Similar is his deduction from Deut. xxiv. 19, which says, "When thou cuttest down thine harvest in thy field, and hast forgot a sheaf in the field, thou shalt not go again to fetch it: it shall be for the stranger, for the fatherless, and for the widow: that the Lord thy God may bless thee in all the work of thine hands." "Here," argues Eleazar, "the Bible promises blessings to him by whom a good deed is done unintentionally; hence if one unwittingly loses money, and a needy one finds it and sustains life thereon, God will bless the loser for it" (Sifra, Wayiḳra [Ḥoba], xii. 13; Sifre, Deut. 183). Eleazar was independent in his Biblical interpretations. He often rejected Akiba's opinions, remarking, "Even if thou persist the whole day in extending and limiting [see Hermeneutics], I shall not harken to thee" (Sifra, Ẓaw, xi. 6; Men. 89a), or, "Turn from the Haggadah and betake thee to the laws affecting leprosy and the defilement of tents" ( ; Ḥag. 14a. Sanh. 38b). Above all, he strove to be methodical. When one applied to him for information on a Biblical topic, he furnished that; was he called upon to explain a mishnah, a halakah, or a haggadah, he explained each point. Eleazar was opposed to frequent sentences of capital punishment. In his opinion a court that averages more than one execution in the course of seventy years is a murderous court (Mak. i. 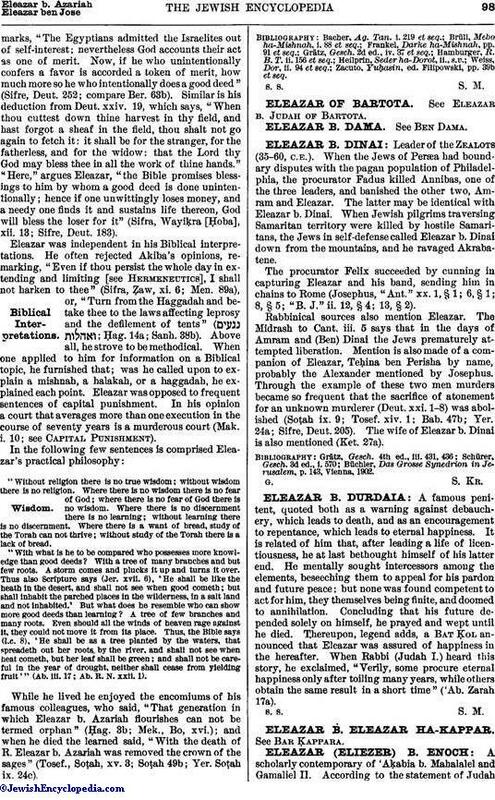 10; See Capital Punishment). Wisdom. (Ab. iii. 17; Ab. R. N. xxii. 1). "Without religion there is no true wisdom; without wisdom there is no religion. Where there is no wisdom there is no fear of God; where there is no fear of God there is no wisdom. Where there is no discernment there is no learning; without learning there is no discernment. Where there is a want of bread, study of the Torah can not thrive; without study of the Torah there is a lack of bread. "With what is he to be compared who possesses more knowledge than good deeds? With a tree of many branches and but few roots. A storm comes and plucks it up and turns it over. Thus also Scripture says (Jer. xvii. 6), 'He shall be like the heath in the desert, and shall not see when good cometh; but shall inhabit the parched places in the wilderness, in a salt land and not inhabited.' But what does he resemble who can show more good deeds than learning? A tree of few branches and many roots. Even should all the winds of heaven rage against it, they could not move it from its place. Thus, the Bible says (l.c. 8), 'He shall be as a tree planted by the waters, that spreadeth out her roots by the river, and shall not see when heat cometh, but her leaf shall be green; and shall not be careful in the year of drought, neither shall cease from yielding fruit'"
While he lived he enjoyed the encomiums of his famous colleagues, who said, "That generation in which Eleazar b. Azariah flourishes can not be termed orphan" (Ḥag. 3b; Mek., Bo, xvi. ); and when he died the learned said, "With the death of R. Eleazar b. Azariah was removed the crown of the sages" (Tosef., Soṭah, xv. 3; Soṭah 49b; Yer. Soṭah ix. 24c). Zacuto, Yuḥasin, ed. Filipowski, pp. 39b et seq.